Are you a small business owner or marketer struggling to utilize Facebook to the best of its potential? If you are actively using Facebook, we have several steps to see if you are falling into any of these traps. If you’re like a lot of small business owners, you might have a love/hate relationship with Facebook. You know it’s necessary for your business, but you’re not seeing engagement and your posts aren’t reaching anybody. You have no idea what to post and you’re stressed about posting daily. 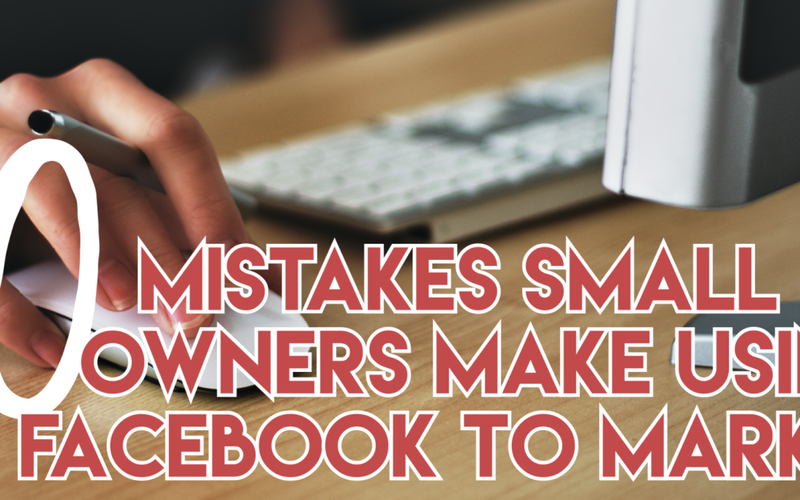 Here are ten common mistakes small business owners often make when attempting to use Facebook as part of their marketing plan. Awareness of the ever-changing Facebook and Instagram algorithms is key when talking about social media in marketing. It’s constantly evolving and requires dedicated research to stay in touch. Find someone you trust, get on their email list, join their Facebook Group and let them keep you in the loop on algorithm changes. If you don’t want to commit 15-20 hours a week studying the algorithm, you can find someone who does who will help you digest the individual points and how the algorithm works so you don’t have to do all the homework. Read more about the Facebook algorithm and how to conquer it on our blog. Never hit the boost post button. It probably does work for some of you and you see results. While the boost post button might show you a little success, you are not fully tapping into the potential you would see with the Facebook Ad Manager. The best way to do this is move your business over to business.facebook.com and you will see the benefits of what ads can do for you. Why would you just want to reach more people? Don’t focus on reach. Instead, why not pay a small amount every time someone selects a link you shared or commits to attend your event? That is what you should be paying for: a commitment. There is zero commitment in reaching more people. Only posting photos, links and text is going to push you down in the algorithm. Facebook doesn’t want to send people off of Facebook so when you post a link or a YouTube video, you are going to be hidden from more of your followers than you realize. It’s OK to use text, pictures, and links, but do it wisely. Instead of posting a link to a YouTube video, upload the video file itself. You need to be posting more video, and live video is best. Hands down you will reach more of your followers by doing so. When they see you in action, it’s invaluable. Say you own a farm. Pull out your camera and walk around the farm explaining what goes on there. If you are a photographer, do a live video on how to dress for family photos. Going live can be scary, but the benefits are incredible. Without a call-to-action in each of your posts, you’re gambling with engagement. For example, let’s say you are a Health and Wellness Coach, if you throw up a picture of your dinner with a statement like, “Chicken and Rice with Green Beans”, you likely won’t get much engagement. If you put up the same picture with the caption, “I’m running out of new ideas for dinner, what are you guys eating tonight?”, you are much more likely to have followers engage with your post. You want people to share, tag and comment on your posts, not just like them. Likes are not real engagement. Some businesses are seasonal – they’ll sell most of their product in the fall and not sell again until spring, or they have an annual sale during the summer and spend the rest of the year working on other aspects of their business. A mistake so many of these businesses make is to only start posting when a sale or a big event is approaching. They’ll post consistently for a couple weeks and then disappear until the next promotional event. If your customers don’t know where to find you, they’re going to look elsewhere. If you disappear, they will, too. There is always someone else who can share similar knowledge in place of you. If they are consistent and you aren’t, you will see far less success even though you have the same type of knowledge to offer. On social media, and just in general, people don’t want to be sold to. They want to see things that are funny, informational, interactive, and educational. If you regularly use sales and promotional posts such as “Sign up here”, “Join this,” “Buy now,” “We have a BOGO”, people will get tired of you and will unfollow your page. Instead of selling non-stop, provide something valuable for your followers. You are an expert at what you do. If you make a living off of your social media, it’s understandable to want to sell what you have to offer. But it is more important to become the person people think of when they want what you offer. You should provide value on three posts to every one sales post. You need to become an expert “go-to” person in your industry. People should think of you when they think of your industry. What is your zone of genius? Hone in on that. Your company might provide 20 different services, but you can’t fully promote each of them. Choose one key aspect of your business and stick to it. At Krose Marketing and Consulting, we offer a ton of different services, but we push social media the hardest. It doesn’t mean the other aspects of our business aren’t as important, but we found our key expertise and have made it a niche. This is the opposite of what you should do. As consumers, we don’t like to be invited to pages we wouldn’t purchase from. The number of page likes does not matter. What does matter is the percentage of the people who follow you who actively engage with your page. If you’ve invited your uncle, third-cousin, and second grade teacher to like your page, they’re most likely dragging your percentages down and it will lower your chances of being seen in the NewsFeed. Read more about getting Engagement that Matters, rather than counting page likes. There are different platforms for a reason. You should write your content differently as you have different customers on each platform. If you have your social media pages connected where if you post to one, it will post to multiple platforms, shut them off. Feel free to use the same images on both Facebook and Instagram, but present them differently. Don’t be afraid to really niche down your Facebook business page. You want to repel as many people as you attract. If you’re attracting everybody, you’re really attracting nobody. Who are your services perfectly designed for? Is it a stay-at-home mom with 3 kids? Maybe it’s a man in his 60s who just had his first grandchild. Whoever your ideal customer is, envision what they would look like walking in the door. What is their income level? Where do they live? What do they do for a living? Get to know this ideal customer and speak directly to them. Learn how to Turn your Followers into Customers. I hope you found these helpful! Join the Krose Marketing and Consulting Crew to stay on the loop on insider tips like these.